Technology is permeating the trucking industry faster than ever, and it’s bringing a host of benefits with it. The combination of computational analysis and control, instant vehicle performance data and more exact manufacturing methods are enhancing durability and fuel economy. 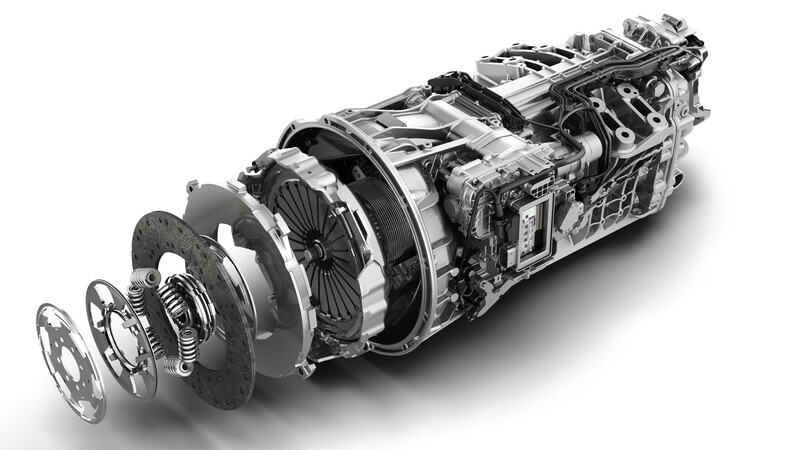 With the Detroit DT12 automated manual transmission, all of these technologies are used to create one of the most intelligent transmissions available on the market. Using features like the ones listed below, Detroit combines this intelligence with manufacturing excellence to offer industry-leading performance. When you get the DT12 as part of the Integrated Detroit Powertrain (IDP), you combine components that are designed to work together. Using a Common Powertrain Controller, the IDP communicates seamlessly between the Motor Control Module on the engine and the Transmission Control Module on the DT12. This offers a level of efficiency and integration that is only available with the IDP. Intelligent Powertrain Management (IPM) is a predictive cruise control technology that is designed for efficiency on hilly or mountainous roads. By accessing pre-loaded terrain maps and the truck’s GPS, IPM looks over 1.2 miles ahead to determine the best gears, acceleration pattern, engine braking schedule and coasting times to achieve optimum fuel efficiency in any terrain. The faster your truck gets to its RPM ‘sweet spot,’ the better fuel your fuel economy will be. In order to get there as fast as possible, the DT12 analyzes load, grade and more to select the best starting gear for your truck. Analyzing the truck’s momentum and grade, eCoast engages when your truck will keep its determined speed without the help of the engine. This mix of idling and coasting increases fuel economy in the short term and maintenance savings (through less wear-and-tear) in the long term. To increase maneuverability in low-speed areas, Creep Mode is available on the DT12. It can be activated in forward or reverse, assisting in smooth operation in close quarters that can sometimes be difficult to maneuver, such as docks and parking lots. When your truck is on a grade of 3% or more, Hill Start Aid is activated. This keeps your truck from rolling back until takeoff without needing to apply the brake. Auto Neutral will engage when certain conditions apply, e.g. parking brake is engaged or vehicle shut-down. When one of these conditions is recognized, the transmission electronics command "Neutral" gear. With these features, the DT12 blends quality manufacturing with technological innovation to deliver unmatched durability and efficiency. If you demand the best, Demand the Detroit DT12.